"What Is Day-To-Day Life On The Road Really Like?" On this page I'll point you to some of my favorites RV travel blogs. Each reflects a unique situation, lifestyle, realization of a dream, or reason for traveling and they are the best of the lot that I've found so far. The only better way to find out is to just do it - stop procrastinating and hit the road yourself. These days it seems that almost every traveler feels compelled to write a blog. Many of them, initially intended only to keep family and friends up to date, have taken on a life of their own. They've replaced trip diaries and, for many, they are as therapeutic as journaling. The following web logs (that's where the word blog comes from) belong to the true REAL unsung heroes of the open road - those who have decided to live their travel dreams now and share the details so that we can all be inspired to live ours. If nothing else, you may be amazed at how many people are "out there" bucking the system, and just doing it "their way." RV Life Camping: Dave and Suzy Myers hit the road full time in 2010 and have been supporting their adventures with a variety of workamping experiences. Rolling Steel Tent: Offers a (nearly) daily glimpse into the nomadic van-dweller lifestyle. He always finds something of interest to report on, often somewhat philosphical, and his posts are seldom very long - you'll have time to read them all. RV Wannabes: A family of five pursuing a life of full time RV travel created this blog as a resource for RV wannabes. Their posts concentrate on traveling with kids and ways to earn an income on the road. Jack's Blog: Already an accomplished writer and photogarpher, unpon retirement Jack hit the road, and is using his talents to describe his journey and insights about life on the road. The Adventure Travelers: This couple has traveled extensively in various ways - currently by RV. They hope to help others learn how to travel more. Camper Chronicles: Lee and Tracy Perkins have been full-time RVers since November of 2015. I highly recommend their blog as the one to read/follow, if you're considering becoming full timers. Their posts are not hyping the lifestyle (as many seem to be these days), but honest accounts that include their emotional challenges, detailed budgets, and experiences with various workamping positions. Our Trip Around the Sun: Carol and John have been RVing full time since 2010. It's works for them by interspersing travels with stopping for weeks at a time to enjoy volunteeing in national parks or taking other workamping positions. Mainiacs in Motion: Full time RVing is not for everyone. I like following bloggers who, like us, manage to have the best of both worlds. Mike and Peggy take extended trips in their RV but keep a home base in Maine. Off Our Rocker RV: Dave and Kathy Boland sold their house in 2017 and moved into their RV full-time. So far, they've had no regrets and no second thoughts. They're doing most of it in our favorite style - "keeping it moving but doing it frugally" and provide a monthly financial report to show where the money went. Old Fat Man Adventure: Barney is an example of not having to go far from familiar stomping grounds to find new adventure. He moves between his favorite haunts in Texas and Alabama (places familiar to us, too, which is what attracted me to his blog). He calls his trailer his castle. His theme is "Don't wait, do it now" and every post is about something he has discovered that's "just too much fun". Take to the Highway: Traveling full-time and alone, Suzanne is "living her dream" and setting an example for other solo travelers: "You, too, can do this!" For a bit of added fun, she weaves inspirational lines from popular music into her writing. Wheeling It: Living the RV Dream with 12 Paws, 40 Feet and the Open Road. In 2010 we quit our day jobs, packed our lives away and moved into a 40-foot tin-can home to follow our dream of living an alternative life and exploring the US on wheels. In 2018, they sold their bus (the Beast), crossed the pond, bought a smaller campervan (the Mini-Beast) and are now taveling through Europe by RV. Through it all, they continue to post regular updates and lead the way, creating a roadmap for the rest of us who have dreamed of doing similar. Technomadia: Two "Domestic Nomads" traveling North America, first by RV and, lately, splitting the year to spend half of their time exploring by yacht. " Gone with the Wynns: Jason and Nikki describe themselves as perpetual travelers, RV’ers (who have currently moved to boating) and modern day documentarians. Since 2010 when they hit the road full time, their blog has gained one of the highest followings on the RVing circuit. They're young, fun, quirky, adventurous and impromptu. I'm hooked! The Amators Adventure Club': Can't remember where I came across this blog but I love Traci's honest, personal, and often humorous, musings! Drivin' & Vibin': Every new RVer should subscribe to this one. Olivia and Kyle bought a 1985 trailer, gutted and remodeled it on their own, and hit the road full time. They've been constantly putting out great, educational content - often in a video-blog. New American Nomads: Proof you don't need a big rig for full-time RVing. This couple are doing it in a Roadtrek. "Minimal home, maximum life". A Manner of Traveling: The mom of the family puts her heart and soul out there with every post. One gets the sense that she's writing for herself, her family, her personal memories, and that we have somehow been privileged enough to sneak in - to be included in her audience. On the Roam Again: This young family wanted their daughters to have a passion and knowledge of the world around them. And they didn’t want to cram it into 1 week a year. With a lot of planning and preparation, they finally took to the road in January, 2016. On the Road of Retirement': Since retiring in 2017, John and Sharon, have been traveling the country by RV. The blog offers some great practical tips they've learned along the way as well as John's ebook, Budgeting for the Full Time Rver - a bargain at only $1.99. Live Small Ride Free: On the road since March, 2015, Ching and Jerud manage to live (almost) fosil-fuel free. Their fifth wheel is totally electric while their truck runs on waste vegetable oil combined and diesel. I really enjoy the indepth description they write about many of thier hikes. The Lady is a Tramp: In 2015, after 20 years, Tammy ceased practicing law at the age of 46, sold the house and everything in it, and jumped into her 2008 Newmar Ventana to start her adventures on the open road. Loafin Around and Kanoe Tripping: Passionate about camping, canoeing, and adventurous travel, this Canadian couple has explored much of North and Central America (currently in a truck-camper, going everywhere there are roads and, where there are none, on foot or by water). Beware: reading this blog may make your adventures seem rather "wimpy" by comparison. Diversity: Karen and Greg share the adventures of a wandering lifestyle that's taken them through the lower 48 States, Canada, and Alaska. RV Love: When Marc’s new job allowed him the opportunity to work virtually and Julie launched her own business, they decided it was a brilliant opportunity. They are now traveling full time in an RV. Their YouTube video blogs depict A Slice of RV Life. We're The Russos: Fresh to the lifestyle, this young couple has jumped in with both feet - full time RV travel and a great blog. I particularly like that they're posting their monthly expenses. Life Unscripted: Peter writes in thought-provoking detail about the full time RV lifestyle and every day situations - not glorifying the good or masking the bad. I love every word he writes! Living and Boondocking in Mexico An American seizes an opportunity - and writes about the adventures and challenges of living, working, and traveling between two countries. Life's Little Adventures: Jim and Gayle packed up in 2008 and have been traveling full-time since then in their Lazy Daze RV. They say they plan to keep traveling for as long as they're having fun - reading their blog, it's pretty obvious they still are. In the Direction of our Dreams: Sherry and David retired early when the great recession hit to hike and kayak all the country’s National Parks and National Wildlife Refuges. Rolling in a RV - Wheelchair Traveling: Provides information about accessibility for people with physical limitations but this extremely well-organized site is crammed full of helpful facts for all RVers whether they need the accessibility information or not. NC Motorcyclists: Jim is a full time RVer who's into motorcycles and ATVs. He's a great photographer with a wry sense of humor. The Good Luck Duck: Roxie flew off in May, 2011 and hasn't landed for long since - it's an adventure just to follow hers! Live. Work. Dream: In 2007, Jim and René sold their California business and home to travel and decide "what's next?" Years later, these young RVers are still criss-crossing the country as digital nomads, sharing their road trip experience with others who dream of embarking upon a similar adventure someday. The Professional Hobo: In 2006, Nora Dunn decided to take the plunge. She sold her financial planning practice in Toronto Canada, and got rid of all of her belongings for the adventure of a lifetime. Since then, she has been traveling and discovered more than she could ever imagine. With no end to her travels in sight, enjoy the entertaining chronicle of her adventures. Roads Less Traveled: Mark and Emily, full-time adventurers, discovered the joys of boondocking and how it can stretch the travel budget. If their adventures and fantastic photographs don't inspire you, nothing will. Life On The Open Road: Diana has been a full-time RVer for 10 years, primarily "boondocking," camping free without hookups, in the Western US. The Bayfield Bunch: Kelly and Al live in Southern Ontario in the summers and, like many snowbirds, travel to the southwestern states in the winter. The photography on the site is nothing short of amazing!!! A favorite Al quote: "Only thing better than right now will someday be the memories of right now." The Airstream Chronicles: Rich has transformed his passion for the outdoors and photography into a life of traveling the countryside in an Airstream RV. Naturally, he posts some pretty amazing photos. Along the Way with J and K: On a wing and a prayer....full-time RVers since February 2005 - and sharing all they learn while living their dream life. The Adventures Of Tioga And George: George, called himself the greatest vagabonder of all time. He survived a battle with cancer in 2003 which prompted him to immediately assemble "his team" and hit the road. Although he left RVing behind a few years ago, his writings inspired so many and are still a valid point of reference. lifestyle? George rarely payed for camping and he listed his travel income and expenses for all to see. A Life By Design: A young Canadian gal who traveled by RV through Canada and USA for years, has redesigned her life once again. She now spends winters in Mexico (without the RV). Scenic Pathways: While living and traveling in a Rialta RV, Ross and Jo write a blog that doubles as an on-line travel resource - listing scenic drives and beautiful places across the USA and Canada. The Boondockers Welcome Blog: I'd be remiss if I didn't add this link. Boondockers Welcome, the sister website to Frugar-RV-Travel now has a blog. You'll find posts from my point of view, as well as that of my daughter, Anna (my amazing partner in that venture), and guest blogs written by our Boondockers Welcome members. I'm constantly finding new favorite RV travel blogs to add to this blogroll. If you are currently on the road yourself and write an RV travel blog, or if you know of other exceptional or unique blogs that would contribute to showing the diversity of travelers who are "living their dream" please let me know so I can add them to the above list and follow their travels myself. "What Is YOUR Day-To-Day Life On The Road Really Like?" Perhaps you have a story to share but don't really want to get into writing a blog to do it. 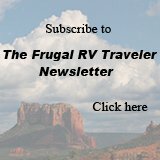 The readers of this website would love to hear about your RVing experience. Just click here for simple instructions to submit your story or read those of other RVers.